Rolling over into July, we’ve been very happy to see strong numbers of mid-sized Chinooks showing up along the kelp beds this week. They’re widespread, from Cape Edenshaw all the way to Green Point. Through June we’ve done the bulk of our salmon “catching” a little offshore, along the 130-foot line. Much of the current catch is coming from a little closer in, often from depths 18-28 feet. The Tyee Bell has been ringin’ for sure. Mark S boated a big 40-pounder at Cape Edenshaw with his guide Nick Mercer on Tuesday while Liam N released a barn door halibut that taped out to 104 pounds today. 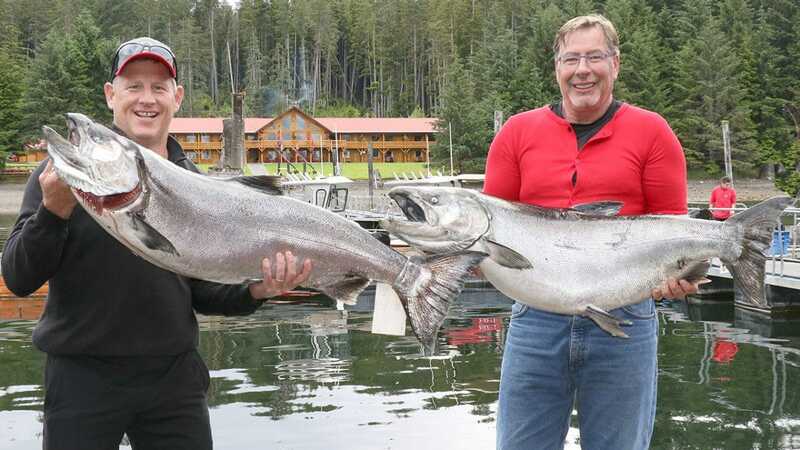 Long time lodge guest Jim B also landed a 40-pound Tyee, fishing self-guided with his partners Andrew and Jay. Veteran QCL guide Ryan Winger celebrated a career benchmark yesterday with his guests Greg and Chris. Green Point turned out some big fish for these boys and they didn’t waste the opportunity. Chris landed a pair of 31 pounders while Greg started with a 30 and capped it off with a stunning fish that tipped the scale at over 47 pounds! As if that wasn’t enough, they spent a beautiful calm afternoon offshore and boated 35 and 31-pound halibut! That’s an amazing day of fishing by any standard! We’ve been spoiled by light variable winds this week and the offshore grounds have been the perfect spot to hang out and jig up some halibut and lingcod. Flatties in the 30-pound class have become pretty normal for us this year and QCL guests really appreciate the excellent GPS/Sounder units installed on every boat. Between the offshore jigging and the inshore trolling we’re find increasing numbers of Coho spiced with the occasional Chum salmon. These early Coho are generally in the 5-8 pound range and they provide a nice compliment to all the other tasty treats in the box! The weekend is shaping up really well with light winds from the west and moderate tides. We have a full slate of guides on the water this weekend so expect to see some great catches on the books! Will keep you posted!